Alongside most 'mainstream' content on GOV.UK, you'll find links to other related items of content. For example, if you're looking to book a driving test, you'll find links to a list of driving test fees, and information on how to cancel or reschedule your test. Today, we're making some changes to how related links appear on GOV.UK. After we made significant revisions to the layout of guides last month, we also experimented with related links, separating them into multiple groups based on the subsection of the related item. Our prototypes performed well at user testing: almost all the users who tested the designs commented that grouping the related links together made them clearer and easier to use. The changes are most noticeable on items with many related links: previously, long lists of related items were often confusing and cumbersome to navigate. Additionally, from today we'll begin to display related links to external websites too, for example a link to the Consortium of Voluntary Adoption Agencies on the child adoption guide. External links will be added where we feel another website would be useful and relevant to help meet a user need, in accordance with our linking policy. We will continue to test and measure just how well related links perform in the wild, making refinements as we go. And, as always, your feedback is appreciated. Just love the way you're constantly refining the site, and so openly. 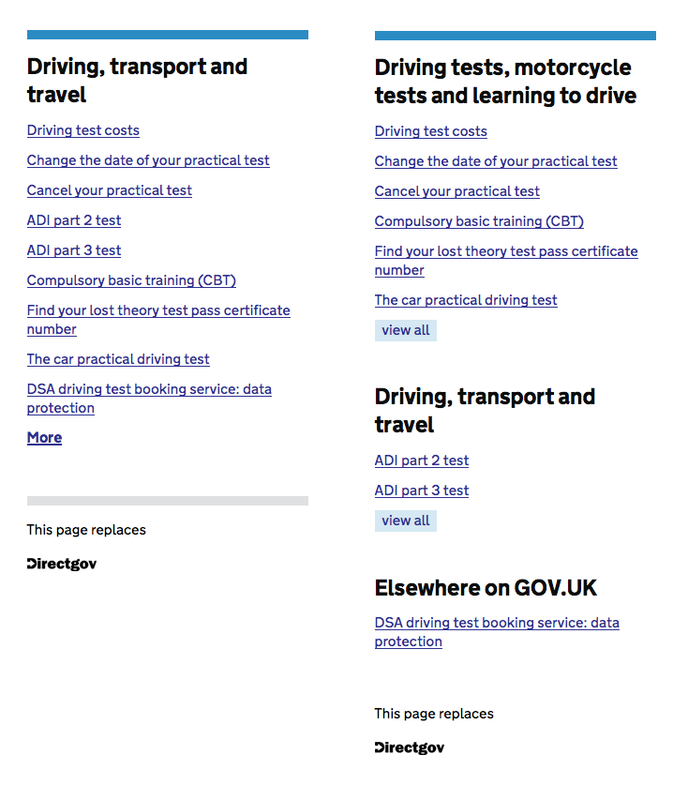 Maybe about time to remove the old 'This page replaces Directgov' notes. Apart from the fact that every time I see the word 'Directgov' it gives me a frisson of horror, as memory of it recedes into the past it is becoming less relevant and more confusing. Thanks, Roger. Analytics and other user research tells us that there's still a lot of public recognition of the 'Directgov' brand. We know that not everyone comes to the site very frequently and at the moment some people will still be arriving at GOV.UK for the first time (sometimes even having been redirected from an old Directgov link) and we're keen for them to be confident about where they arrive. We're keeping an eye on it, but it will take a bit longer before the Directgov brand is sufficiently distant history before we can remove that reassurance. Think the new site is brilliant and a great example of what can be done with such a lot of data. Just one comment on the screenshot above - the new layout is definitely clearer but is there any way you can look at removing unclear acronyms too? I've no idea what an ADI test is, and why I'd be interested in parts 2 and 3 of it. If there was a way to display these things in the same way as the CBT link - written out full first time, abbreviation in brackets, then abbreviations in content as necessary - I think it'd make things even clearer. Yep, some of our content titles are in need of some love. Thanks for pointing those ones out. still seems to have the old version, and in English. and their source shows html lang="en"
Is there a systematic approach to dual-language versions in the standards? I'd echo your comments, Roger, but just as we got used to all that "Directgov" stuff they go and change it! Just when we have got used to these Government blogs I'm sure they'll do away with them and put something else up for us to get used to! !